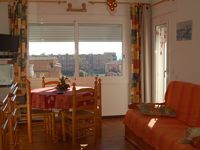 Property 1: Nice apartment 100 meters from the beach. Sheets, towels and Wifi offered. Stunning Views ON THE PYRENEES AND MARINA. Property 43: Stunning Views ON THE PYRENEES AND MARINA. Apartment in Empuriabrava. 50 meters beach and trades. Property 48: Apartment in Empuriabrava. 50 meters beach and trades. Very comfortable flat - good local amenities. Very welcoming couple. Thank you we have enjoyed our stay.